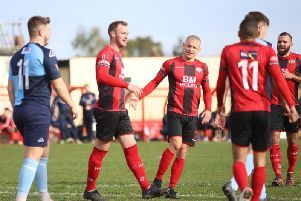 Captain Michael Richens scored the only goal of the game as Kettering Town tightened their grip on top spot in the Evo-Stik League South Premier Division Central with a 1-0 victory at Rushall Olympic. Marcus Law made three changes to his starting line-up following the fine win over fellow high-flyers Stourbridge. Luke Graham, Rhys Hoenes and Gary Stohrer were also restored to the team with Dion Kelly-Evans and Durrell Berry not included in the squad while Ben Milnes started on the bench. The Poppies were boosted by the return of Andrea Borg following his international duty with Malta Under-21s. The winning goal came after 26 minutes with Richens heading home from a corner for his second strike in as many matches. Rushall had their chances in the second half and Paul White saved well from Ben Lund before producing an even better stop in injury-time when he clawed away a downward header from Kev Monteiro. That preserved an eighth clean sheet of the season in the league while the Poppies remain unbeaten on the road with eight wins from nine matches away from Latimer Park. Law’s team will be back on home soil on Tuesday night, however, when they take on Redditch United.